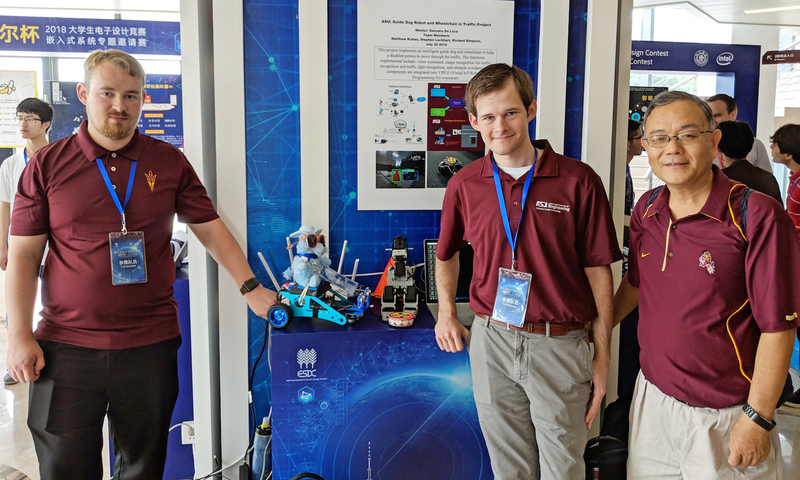 The Intel Cup is held every two years, and ASU has now won a first-prize honor in three consecutive competitions: 2014, 2016 and 2018. ASU students won a second-place prize in 2012. The competition is jointly hosted by the Higher Education Department of the Ministry of Education and the Personnel Education Department of the Ministry of Industry and Information Technology; organized by the Shanghai Municipal Education Commission and Shanghai Jiaotong University; and co-organized by Intel. This school year, nearly 10,000 Arizona State University students heading to campus will receive scholarships funded by private support. Scholarships, while not a replacement for public funding, offer students the opportunity to go above and beyond in their pursuits. Many recipients are using these awards to pursue careers in fields they may not have had access to without private funding. Meet some of the scholars making moves to shape their futures. Scholarship: Green is a recipient of the Mark Bowland Leadership Fund. This award recognizes the contributions of young adult leaders who identify as LGBT and the indelible impact that their efforts have on the present and future. His story: Green, a senior majoring in management in the W. P. Carey School of Business, took a leave of absence last semester to intern at Creative Artists Agency in Nashville, a nationally recognized talent agency. Upon his return, he was selected as the leading talent buyer at Steve LeVine Entertainment in Scottsdale, Arizona. Building on skills he learned through his internship experience at CAA, he recently produced and planned concerts for performing artists such as Alesso and Adventure Club. He is majoring in management in the W. P. Carey School of Business and is pursuing a certificate in special events management. Scholarship: Siraj is a recipient of the ASU Dignity Health Scholarship Program. Dignity Health provides scholarships to students interested in careers in health care. Their values include academic excellence, volunteer service, community involvement, human kindness, compassion, and desire and commitment. His story: Siraj is a pre-health junior in the College of Liberal Arts and Sciences, majoring in biological sciences. Through his scholarship, he had the opportunity to volunteer at Dignity Health, which taught him about patience and hard work, and also inspired his decision to choose a career path that ultimately serves others. Scholarship: Cabrera is a recipient of the Rizai Family Scholarship. The Rizai Family Scholarship was created through the generous philanthropy of Matthew Rizai to ensure access to higher education for talented individuals. Her story: Cabrera, a first-generation college student, is a freshman attending the Walter Cronkite School of Journalism and Mass Communication, majoring in journalism and mass communication. She chose ASU because she wanted to remain close to her family in Maricopa, Arizona, and study at one of the top journalism schools in the country. Learn more about supporting students at ASU.